You might have seen these incredible Moroccan sand dunes full of camels and luxury tents on Instagram. They can look dreamy. But don’t be fooled – not every desert tour company will take you there, as each desert camp looks different. 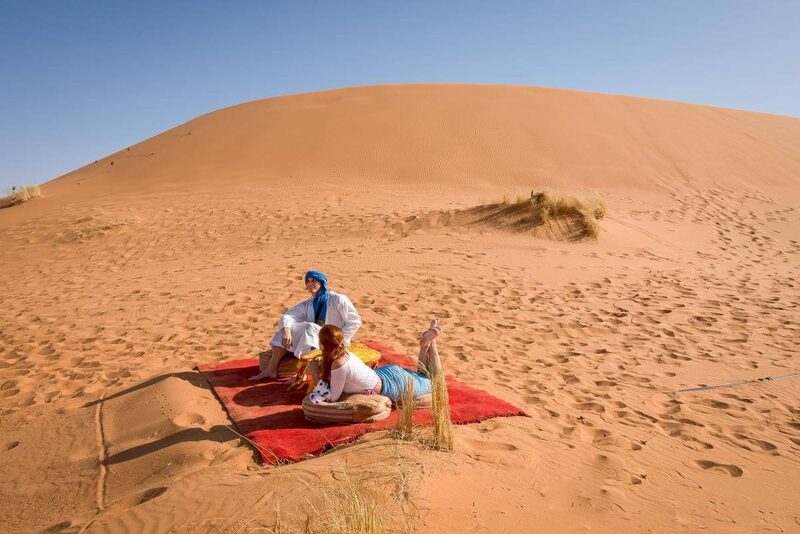 Wherever you go in Marrakech or search online, you’ll find hundreds of tour operators offering desert tours ranging from 1 to 3 nights and the abundance of options can be a little overwhelming. One thing to understand about desert tours in Morocco is that there are two desert spots, quite far from each other: Merzouga and Zagora. Since most trips start in Marrakesh, you need to keep in mind that getting to any desert spot in Morocco will take a long time. And I mean a VERY long time. Do you want to see sand dunes? 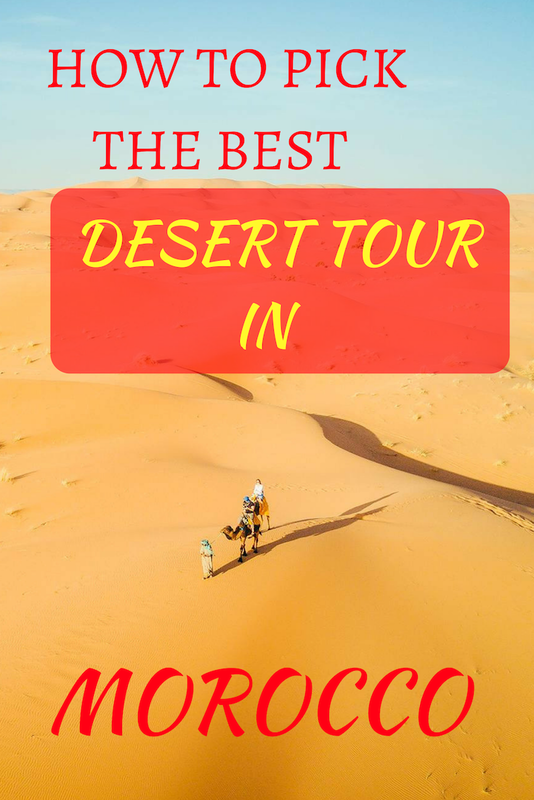 The one day tour is for people who have a limited amount of time to see the desert and want to see some sand dunes. Don’t expect to see any incredible and tall dunes. You’ll be taken to a desert region around the city and might get a camel ride. I’d generally advise against taking this tour, but it’s your choice! The 1-night tour will take you to Zagora desert, as it’s 6.5 hours away. 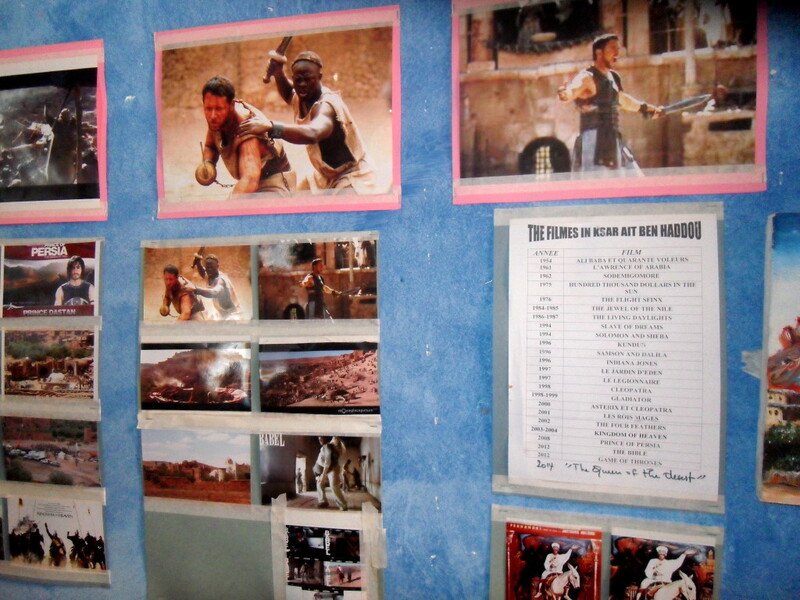 On the way, you’ll stop in Ouarzazate and see the village ofït Benhaddou and on the way back at Atlas Film Studios. 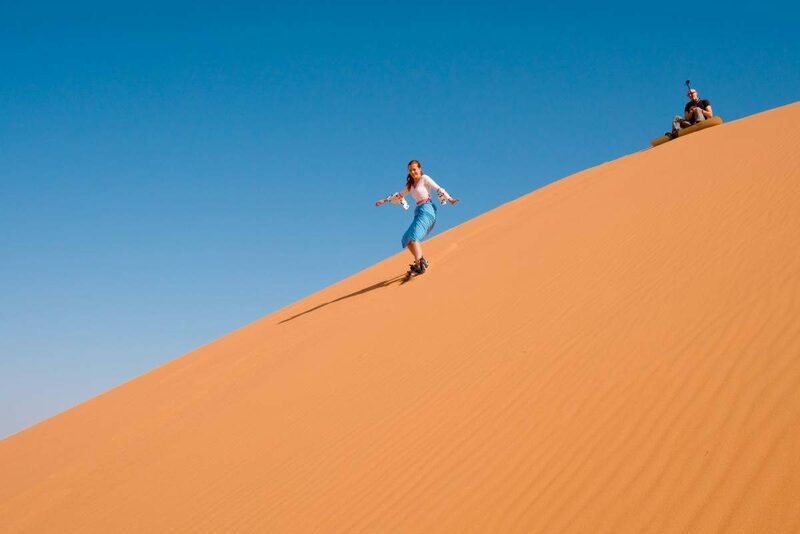 While you’ll sleep in the desert and complete a camel trek, you won’t see any golden sand dunes. Usually, a 3-day tour will put you in a hotel for the first night to split a 10-hour drive, before moving further to Erg Chebbi dunes (Merzouga). You’ll see the same spots as on a shorter trip, but you’ll have more time at each place of interest. Merzouga has many camps for different standards, but unlike in Zagora you’ll be able to find glamping tents with private working shower and toilet. If you want things booked in advance: You can simply book a tour on Viator. This way, you can have a guarantee that you’ll be able to do it on certain dates. If you want to save money: Book something at your riad upon arrival. You can save up to $50 if you book and pay things upon arrival. Alternative option: If you’d rather not take a group tour and private tours are too expensive, you can surely follow my example and do the whole thing on your own. I rented a car and drove to Ouarzazate on my own, seeing all the spots by myself. After a night spent in a local guesthouse in Ouarzazate, I drove further to Merzouga and got picked by a camp manager. I booked my car on Discover Car Hire and a spot at the camp on Booking.com. Price really depends on the tour you pick and standard of your camp. Some 3-day tours can cost as little as $70 but they usually exclude food. If you want to glamp, I’d say a good price would be between $200 to $300 per person including transportation. Zagora is a desert in the southern part of Morocco. While it’s a desert, it’s a dry stone desert so don’t expect any magnificent sand dunes. Camps in Zagora are usually budget style, similar to those in Oman, so toilet facilities will be shared. Honestly, I haven’t encountered a camp with a working shower, but this might have changed. After arriving at a camel camp, we had to bring all our belonging with us and attach it to our fluffy vehicle. As I wasn’t aware of that I ended up packing all my stuff into plastic bags which made me look like I went shopping on a camel. Quite ridiculous. An hour more of camel riding and we reached our camp for the night. 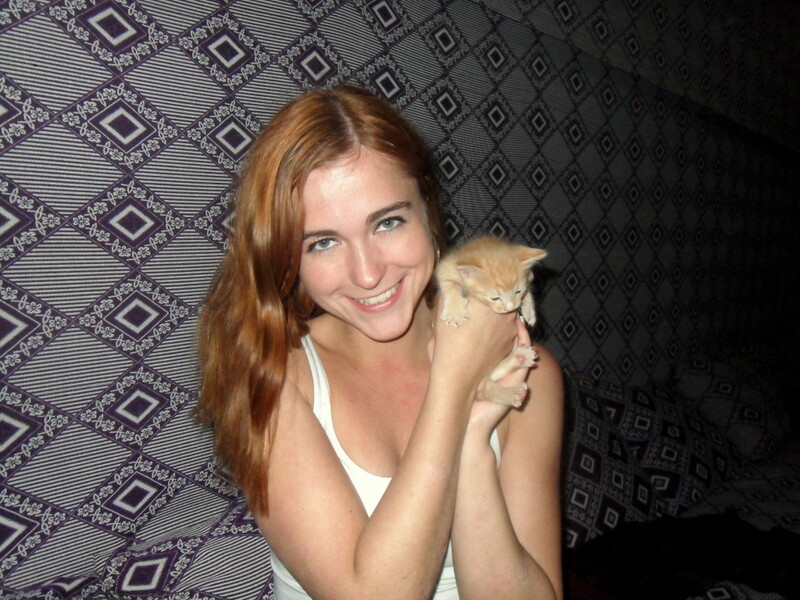 There was not much going on apart from chit-chat conversations with locals, although I was very happy to get a chance to play with 3-weeks old kittens. An evening was spent eating chicken tagine, listening to our guides play Berber music and playing with some desert kittens that I ended up finding in the main tent. The tents were extremely basic and freezing at night. I ended up sleeping in my clothes, covered with a blanket, but the sand still got inside it. I tried to see the stars at night, but as the camp isn’t located too far from towns I didn’t get to see any. 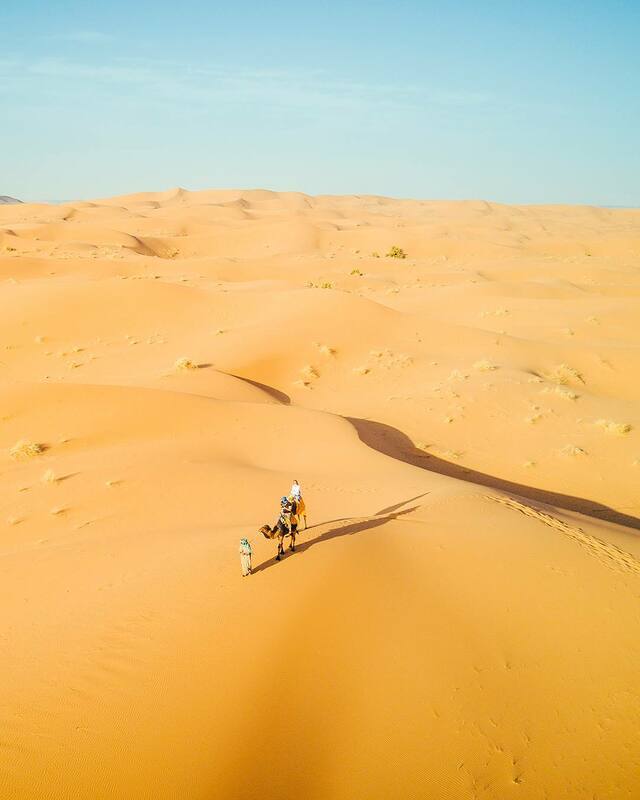 Measuring around 22km by 5km, the Erg Chebbi dunes in Merzouga form an intriguing in the otherwise flat and rocky desert that marks out the Moroccan portion of the Sahara Desert. If you think of a sandy desert, Merzouga area is your answer. 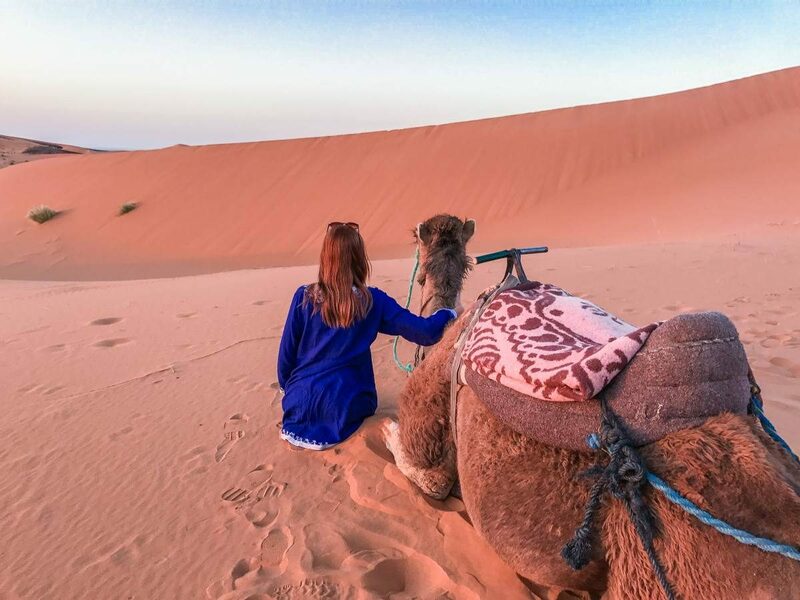 Most desert camps in Merzouga are luxury camps and even cheaper spots are more focused on an individual, rather than mass experience. As a result, you won’t find giant camel meeting spots and won’t see huge groups riding camels together. There are other camps around, but the dunes are so vast that we only saw people in the distance. Unlike in Zagora, we’re brought to the camp by car, so I could throw even my small suitcase in and I wouldn’t look like I just got back from a camel shopping trip. Each private tent had its own bathroom, with a fully working shower (on the desert!) and electric fan. Once everyone unpacked it was time to hop on a camel and ‘drive’ around before sunset and dinner tagine. In the morning I had time to do some sandboarding and actually ride a camel again upon request. We were free to do whatever we wanted with just 6 other people staying at the camp. Both places will offer you a chance to stop at some fascinating spots and let you dive into Berber culture. Most of these spots are located in Ouarzazate area. After talking to the inhabitants I found out that most of the star in the movies all the time and the village transforms for every movie. In fact, they built a separate entrance to the village for the Lawrence of Arabia, as the actual one looked unappealing on the big screen. The fake one has never served an actual function of an entrance. There you can meet one of the artists who make these gorgeous traditional paintings using saffron, tea, indigo, water and an open flame. Or simply drink some Moroccan mint tea on top of the kasbah (small village). Another spot you’ll pass on the way is Dades Valley, also known as the Valley of Roses. Rose petals are really important for Morocco export, as they produce rose oil that works similar to the argan oil, also Moroccan. It’s very easy to spot an argan tree as it’s the one with goats on it! Entire valley smells like roses, so if you’re driving remember to lower your windows. I ended up purchasing a bottle of rose water which I kept putting on Matt. While he hated it at first, he admitted that this stuff really works and smoothes your skin. Visiting Atlas felt quite surreal to me because I expected something similar to my tour of Warner Bros Studios. But it’s quite the opposite. 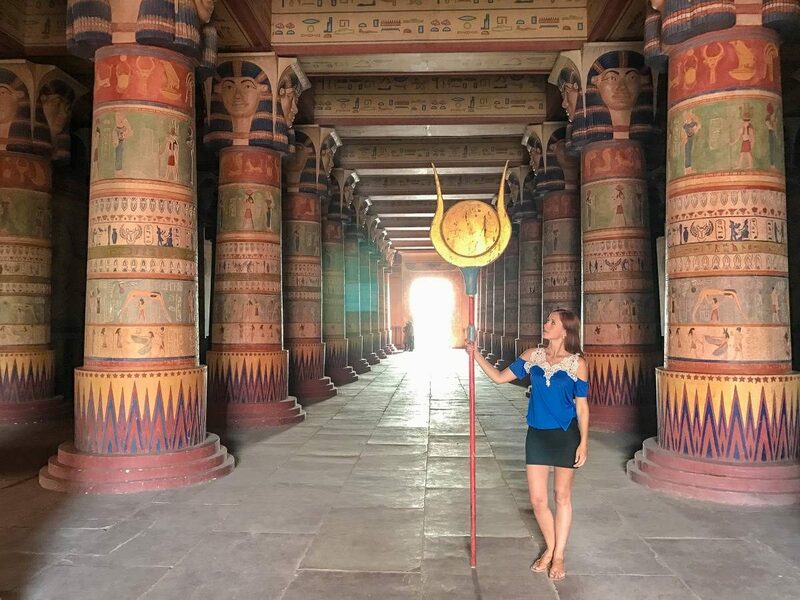 You can wait for a tour at certain hours to hear what a guide has to say about each spot but… You can also wander on your own, touch everything, play on set and film everything. Matt and I even did a mini-movie for fun! I’ve done my fair share of desert experiences in different countries. While the choice is yours, I’d ultimately advise against going on a desert trip to Zagora. The majority of people I met on my trip and from what I read online later were disappointed. So was I. If you don’t have an extra day, I’d recommend skipping the desert tour and exploring more of Marrakesh. There are plenty of things to see and do in Marrakesh, so you won’t be bored. Any questions about the desert in Morocco? Let me know in the comments! Where was the best star gazing experience you had? I’ve done the desert experience but I’ve heard some places you can see amazing views of the stars with the Milky Way. Stars were visible in Merzouga. In Zagora they aren’t visible as it’s too close to the city, you can actually see street lamps from the camp sometimes. Is it visible from anywhere else that’s closer to city? /could you recommend? There is too much offer and we are really confused which one to chose. We want a good tent and good service. Another question, is the ride very tough? I put links to tours I recommend in the post. I recommend Welcome Morocco Tour! could you see the stars from there really well? i really want to go only for stargazing and not for an entire desert experience. i’ve done camel riding, been on the desert etc. i was hoping to get a good stargazing experience in. Noone can guarantee you the visibility fo the stars anywhere. It’s sort of like with the Northern Lights. The weather has to be not rainy, free of clouds, moon can’t be full etc. Thanks for your blog post! My husband and I are looking into a desert tour in Merzouga and kind of confused between which one to book (it looks like they use the same photos online?). Are they all pretty similar once you’re there? Which one did you go with? If you book a full 3-day tour online you won’t really know which camp you’re going to exactly. They do look the same from the outside, but I obviously didn’t see inside and didn’t know what did they get for dinner etc. I’d say it really depends on who you ask, but for instance: I got the dark blue dress in Morocco (and pink one that you can see in my Chefchaouen article) and got so many compliments from locals for wearing local stuff even though the bottom of both of them was quite short. Most of the time I ended up wearing either the local outfits and many local women stopped me saying thank you for supporting local fashion and that I look great… So personally I’d highly recommend getting some stuff on arrival. In touristy places (Marrakesh, Chefchaouen, etc.) I’d say half of the people are covered from head to toe and other half is dressed like they would in sunny California. Locals don’t seem to mind anything. On the desert, since you’re practically alone, I saw some people even wearing a swimwear (I was wearing tights because I was freezing cold) what I did find a bit weird, but that’s me. Obviously, at your riad or hotel, you can wear whatever you want and regular swimwear for a pool. I think the bottom outfit you’re referring to was from the Atlas Studios, so since it’s a film studio there aren’t any locals there and it was just me and my hubby. I actually ended up wearing a pashmina I got locally wrapped around this skirt most of the time like you can see from the desert photo. Love this article! Your Merzouga trip looks amazing, I was wondering if you could elaborate on it a bit? You did this on your own? How did you execute it? I would like to do something similar to that. I am interested in how difficult is to manage to drive the whole route by yourself? I am thinking about doing the same but am little bit afraid of the route back to Marrakech (it is 10h I guess)? We drove up north to Chefchaouen and stopped in a very small town on the way. But yeah, it would take about 8-10 hours. Hey- were doing the same trip to Merzouga in December but read that renting a car in Morocco you can get charged for randomn things on the end- did that happen to you if not who did you rent from? Nope, everything was very straight forward I must say. Did you have any problems with food issues or feeling sick after being in Merzouga for the night? I have traveling with my 2 kids, 12, and 15. Did you also say it was an 8 hour trip from Marrakesh? Any foods to avoid, or areas? Thank you so much Anna ! Hi, Anna. Where is better desert in zagora ir in merzouga? I dont have time visit both, i have to choose.what would you suggest? As the posts says: Merzouga for sure! Thank you — very helpful in understanding which desert to go with! Hey Anna — I’m at the early stages of planning a trip in Nov for my daughter and myself. I’m wanting to include Merzouga desert trip for sure. My question is: do you think it is safe for a mother and daughter (she’s 19) to go with a tour company and do this 3d/2n trip? I’d prefer a private tour but i’m a little wary of being in the desert with only male guides/driver. Thoughts? 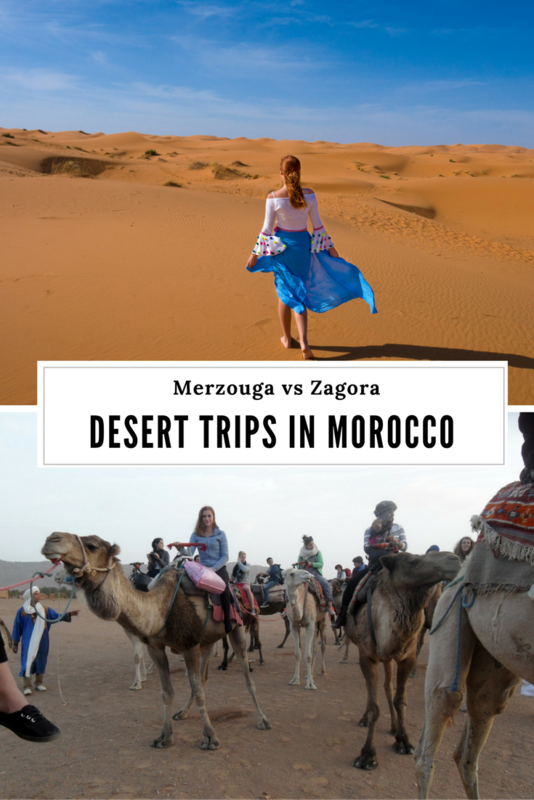 Of course, Merzouga is the safest spot from all others – even the camels don’t bite 😉 Smaller towns like Ouerzazate on the way are actually way safer than bigger cities in Morocco. The first time I went I went solo, the second time I self-drove with my husband. Personally, I’d advice you to do a private tour (or just hire a driver and book a camp yourself on Booking or another website) as you’ll stop at less-touristy spots to eat and your experience will be way more pleasant. Drivers/guides will almost always be males, because of the culture of Morocco, but I wouldn’t worry much about it. Me and my boyfriend are planning a Morocco tour for the summer. 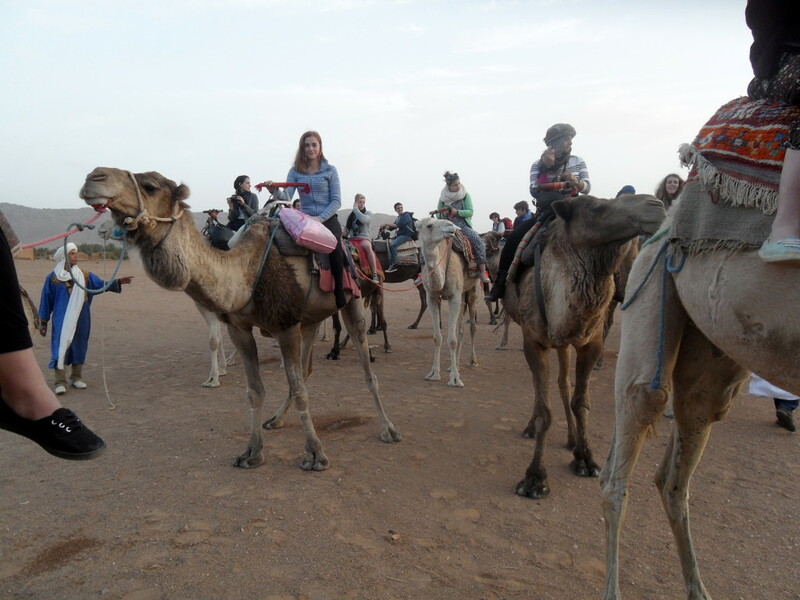 We were wondering at what specific camp did you book your stay and camel ride in Merzouga? We love the looks of the camp in the picture! Hi, it’s called Erg Chebbi Camp now. A spot at the camp comes with a camel ride and pick up from Merzouga town. Very interesting to read, thanks for sharing. Morocco is a place that my friends and I have always wanted to visit. We decided the best way to do this (being four females in our 20’s) was through a tour company. We had many destinations we wanted to visit and activities we wanted to experience. In addition to all the places we wanted to visit, we were lucky enough to be taken to local spots to shop and eat, a definite highlight of the trip. We have had an unforgettable Sahara desert trip, especially due to our wonderful guide. Me and my husband are planning for a Morocco tour in summer. can anyone please help for guide.. I am planning for Morocco tour in august. Can you suggest me which camp i have to join ? Hi (also) Anna, my mom and I will be in Morocco for a week in October, and I’d love to book a trip into the Sahara and just generally get a feel for other parts of the country. If we were to do one of these three day, two night tours, would we be able to bring luggage and store it somewhere or should we pay for an extra two nights at a riad in Marrakesh even though we won’t be staying there? I’m normally a super-light packer, but I want to buy so many things while I’m there that I’m planning on bringing on large suitcase with my carry-on inside. You can store your luggage at your hotel in Marrakesh usually, but for the luxury camps in Merzouga, most people bring their entire luggage since you reach your camp in a 4×4. Oh! great tour…thats what I ever want to visit. I am really so happy with this Morocco tours which I ever expect this marvellous trip. My 12 days at Morocco was fantastic, in those days, I had an adventurous trip of my life. I have been found this great opportunity through the website saharadesertexperience.com which gave me a great experience about the Sahara Desert tours in Morocco. I would love to look back or want to visit again. So I think you should once visit Morocco tours. Zagora is not really a desert but rather rocky area with few desert dunes. You can go there in 2 days from Marrakech which what appeals to some people. However if you are looking for Sahara with fine dunes as far as eye can see then Merzouga with Erg Chebbi dunes (easily accessible ) or Erg Chegaga dunes are much better choice. But for these trips you need to have minimum of 3 days for travel from Marrakech or Fes to make worthwhile. But more days you have the better it is. Thank you SO MUCH for your feedback on the desert tours. I’ve spent many hours researching tours to both Zagora and Merzouga, and not liking much of what I was reading. As soon as I read your page, my decision was made. Thanks again. What month was your trip since it was freezing at night? Great write up. I was planning on taking the 2 day tour for Zagora. Will go form Merzouga now. Oh, thank you for all the information. I am definitely going to visit Moroccan deserts, maybe next October as I read on MoroccanZest.com it is one of the best seasons (and cheapest). BTW, Your outfits are very cute. Love them! Hello Sophie. Are you still planning to go in October? This is incredible! There are many people who have experience the Morocco tour and it is really beautiful place to visit and enjoy. Those Atlas Mountains are truly amazing. Hey Anna, nice text..Maybe you can help me with an advice.. We want to rent a car as well in Marrakesh and go to Merzouga desert… So it is possible to self drive to Merzouga and go to desert from there? Do you need to book it in advance? Also, would you say it is possible to continue self drive to Fez? And last but not least.. which time of the year were you there? We are planning to travel in December (Christmas time) so you have any idea about if the weather will allow this self drive – is it a lot of mountain roads en route? You can’t take your car to the desert itself, but if you book a camp beforehand (even a day before) they’ll pick you up from Merzouga town. We left our car overnight and they brought us back to it the next day. We drove to Fez from there but spent a night on the way, as it was too much driving for one day. December is the rainiest month, so some roads might be wet, but it shouldn’t be too bad. Morocco has a population of over 33.8 million and an area of 710,850 km. It is famous for its natural beauty, from the golden beaches of seaside towns like Essaouira and Asilah to the magnificent arid landscapes of the Sahara Desert. Here, the possibilities for adventure are endless. The country is most beautiful in spring (mid-March to May) when the landscape is green and lush, making for spectacular mountain hiking. Morocco is also lovely in Autumn (September to October) when temperatures are very pleasant. Discover with Sahara Bliss the magic of Morocco and the Sahara. My boyfriend and I are going to Morocco in November and your blog is super helpful in deciding about the Sahara trip. We are also planning to rent a car throughout our 9-day trip across the country. I looked into the luxury camp sites via booking.com and was wondering whether the camel ride to the camp, as well as the 4×4 ride back the next day is included in the price shown in booking.com or are they add-ons? If add-ons, do you happen to know how much they cost per person? This would definitely help in our budget planning. Thanks! Hi! So the camel ride isn’t ‘to’ the camp, as you’re taken there by 4×4 with your luggage and do the camel ride for sunset or sunrise. I didn’t have to pay anything extra for it. For this camp yes, especially since it’s in Zagora so it’s actually not as pretty as in Merzouga. 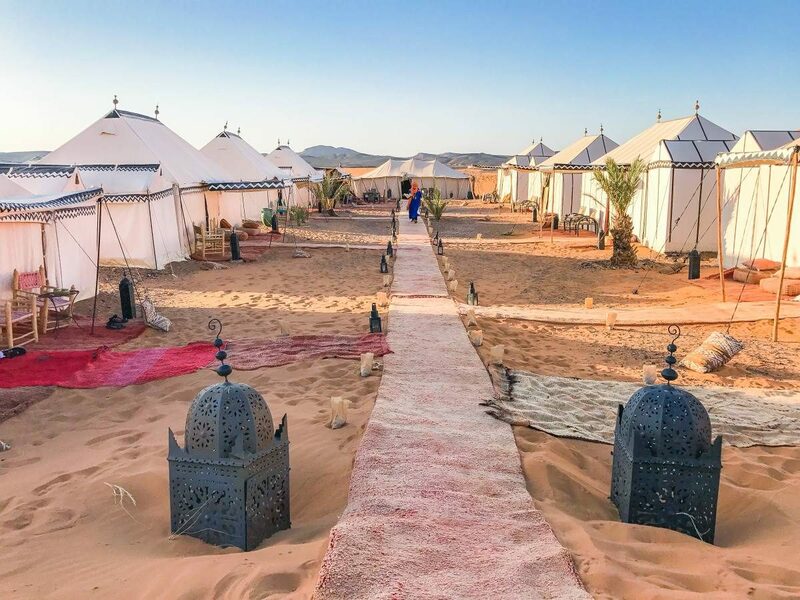 You’d definitely get a nice experience at this camp (nothing wrong with this camp), but if you’re willing to spend money and get the wow factor then go to Merzouga. Loved this. I was motorbiking in Morocco five years ago, and again this past July, mostly in the High Atlas and the Rif. Made it as far south as Zagora the first time. Fes, Essaouira, Marrakech, Casablanca, Oualidia, El Jadida, etc., etc. Saw the Master Musicians of Joujouka both times up in the Rif – completely mind-blowing. It gets in your blood and it doesn’t leave. My enduring memory from Zagora is the sight of a multitude of children dressed all in white coming out to greet at as we entered the city in the late afternoon, waving and smiling, as if they were there just for us. By the time my head hit the pillow, I decided I had that exactly backwards: they were the beautiful beings that my life needed me to meet before I departed it forever, just to remind me that human beauty is not all hollow and contrived – you just have to be willing to make a pretty strenuous trip if you want to see the real deal in our age. I’ll never forget it. I’m trying to put together an itinerary for Morocco (and dont have any set flights yet). But there are cheap flights into Marrakech and want to spend 2 nights there. I want to go to the desert and then there are cheap flights out of Casablanca (everything else TBC). I want to know did you hire your car from Marrakech? Was there somewhere obvious to leave it in Merzouga? After the camp did you just drive straight back to Marrakech in a day? Yes, I hired a car in Marrakesh. After Merzouga, I drove to Chefchaouen and then dropped it off in Fez. The camp you’ll book will tell you where to leave your car in Merzouga (it’s a really small village). In my case it was in front of the house of the owner of the camp. Hi, Anna – love your post. We are travelling to Marrakech in first weeks of November. I want to do three day trip, but we are concerned the drive back (8+ hours) may be too much, especially since we only have 5-6 days in Marrakesh total. Do you think it is work it? Also, tour group we are considering says we would get to stop and “hike” Todra gorge. All tours stop at various places, you’ll probably also stop in Ouarzazate. 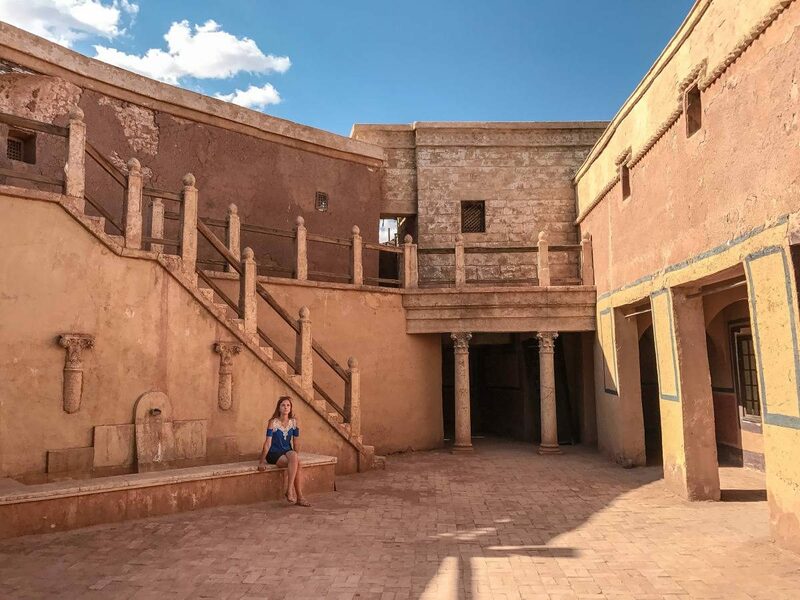 If you really want to visit the desert then do it, but you can also easily spend a few days in Marrakech and take a day trip to Essaouira instead. Hi Ana loving the post. Do you need 4×4 car to drive to merzouga? No, you don’t. It’s a regular highway and roads through small towns. The prices for a 4 day trip seem to be considerably much more than a 3day trip from Marrakech to Merzouga. In your opinion, is the 4 day trip worth it or do you think the 3day trip is sufficient? I think 3 days is sufficient, but many people just don’t want to drive so much within such a short amount of time. It is a tiring trip, I’m not going to lie. Your post is very helpful! I’m going to Morocco on a very adjusted schedule and I reaaally want to spend a night in the desert. Is it too difficult to drive from Marrakesh to Merzouga on your own? I will go alone. It’s a very long drive and you’ll have to spend an overnight somewhere on the way (we did in Ouerzazate), but I don’t see why not. Thanks! That’s a quicks answer! I’m really thinking on going directly, still trying to adjust averything! We (my wife our two sons and 2 aunts) are planning on going to Morocco end of Dec into Jan and want to do a 3 day desert trip, I see the mention of booking a camp on booking.com, but is there any site and/or service that may provide the full 3 day tour – pickup from Marakesh, to the desert and back to Marakesh? any specific site that you have used and had good luck? You mentioned Viator, but I’ve never heard of it. thanks again for all the great information. -Tours normally start from Ouarzazate on 1st Feb and so will come back in Ouarzazate on 3rd Feb. But next day we want to go to Marrakech. Is ist better to drive directly from Merzouga to Marrakech? Do you think is it doable? Or should we still overnight in Ouarzazate and driver early morning 4th to Marrakech? some spend the first night in Todra Gorges and visit Merzouga on the second day (and 3rd day go straigt back to Ouarzazate). I don’t know what are pro and cons of each option, could you give some ideas? – I looked rentalcars.com and some cars are with driver included. Do we need to take care of the driver stay/meals etc if we choose this option, and should we rely on him on picking the restaurants, rests on the way? the hotels/camps we would book in advance of course. – Your itinerary looks good, just make sure to arrive relatively early afternoon to Merzouga as you do want to enjoy the camp and dunes. – That’s a really good question about feeding the driver as it really depends of your agreement. You’d be expected to tip him for sure. Thank you Anna, this is very quick answer, really appreciate :). I will drive, and the driver provided by rentalscar. So I hope that’s not too bad. Last question: are 2 two nights out in the desert (Erg Chebbi) worth it? If we choose that option (1st day Our to Marzouga/Erg Chebbi – Desert Egg chebbi 2nd day and night, with day trip to Rissani possibly – back to Marrakech 3rd day) of course we need to rush both ways, when we start from Ouarzazate in the first day as well as back to Marrakech in the 3rd day. I WOULD BE TRAVELING WITH MY (18LB) SERVICE DOG. IS IT ALLOWED? You’d have to ask specific tour companies and camps. That was a brilliant blog. I’ve booked everything for my Marrakesh trip end of March, apart from the desert tour. hehe excellent! I’ll ask my GF who speaks french to confirm. We gonne drive ourselves and spend 1 night in the desert. Would you recommend spending the night in a camp with a 10 month old baby or better to stay in Merzouga? Can we take turns while riding camels, so one can stay with the baby? There’s absolutely NOTHING in Merzouga, it’s a tiny village. I’d be surprised if there was even a hotel, I personally haven’t seen any or a restaurant around. Camps are awesome and they have facilities, so I don’t see an issue taking a baby. You mentioned Oman in your post, would you compare. Would you compare Sahara desert to Omani empty quarter ? Yes and no. I’d say that Moroccan experience is way more popular and luxurious. The empty quarter felt very rustic and basic. The option of riding camels from the camp wasn’t even possible.